The upcoming Sims 2 Pet game will include a celebrity star and her pet. 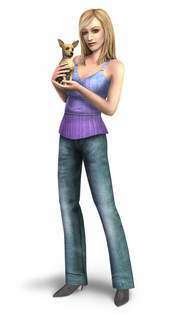 An animated version of Hilary Duff will star in the game along side her pet Chihuahua Lola. She described, "I love creating Sims characters and guiding them through life, designing their houses, and then blinging them out with cool furniture. Now, in The Sims 2 Pets, EA has combined two things I really enjoy â€" pets and The Sims." The game will be released on October 20 for PS2 and Nintendo GameCube.